You are here: Home / Classical Education / What Is Classical Education? Why is this significant? It is significant because the second school realized that our problem is not of recent origin and that it isn’t unique to this country. The decline in our country and our culture is much more fundamental than most people think. And this decline has a lot to do with changes in education over the last century. If we were to visit a good American or English school about a hundred years ago, we would find it focused exclusively on one thing: reading classic literature in the original languages. 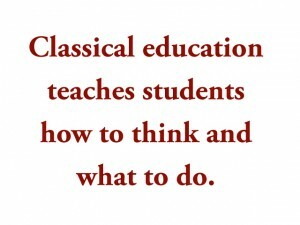 This is what we now call the old “classical education.” It taught students how to think and what to do. It was an education in wisdom and virtue. Students learned Latin and Greek—and through this they learned a set of vocabulary that undergirds all academic language, and they learned the inherent structure of the grammar common to all languages, including their own. They also learned the mental skills required to make the fine grammatical distinctions characteristic of these two inflected languages. 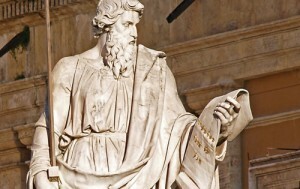 Having mastered Greek and Latin, they then read, analyzed, and discussed the actions of great men. As always, the chief questions asked about the actions of every great man or woman—the question every child asks when first reading about a character—were “Was he good or bad? Why did he act as he did? Who was affected by his actions? What were the circumstances? What should he have done differently? What would you have done differently?” This was an education in wisdom and virtue. This ideal—the man who would think truly and act rightly—was the goal of Greek education. This was the education of the Romans and the Greeks (and everyone who lived in the Hellenic world, including the Jews). It was the education of the Christian Middle Ages, of the American Founding Fathers, and of their Puritan predecessors. It was the prevailing education into the early 20th century before it was gradually thrown out over a period of about 40 years. Today, a new philosophy controls our schools. Its purpose is much different from the purpose of classical education. Today’s schools are about two things: progressivism and pragmatism. Progressivism is a political program that can be seen in an emphasis on political correctness and multiculturalism. Pragmatism is a vocational program that can be seen in an emphasis on job training and employment skills. Today’s education is almost a direct inversion of the old classical emphasis on how to think and what to do; the political and vocational emphases of today’s education teach students, not how to think and what to do, but what to think and how to do. Its political goal is to use schools to change culture, and its practical goal is to change students to fit the culture. The goal of classical education was very different. It was not interested in changing culture or fitting children to a culture. Its goal was to pass on a culture—and one culture in particular: the culture of the Christian West. In classical education, students read the classics. They focus their attention on what the Victorian scholar Matthew Arnold called “the best which has been thought and said.” In Western civilization, our focus should be on what I call the “three cultures”: Athens, Rome, and Jerusalem—the Greeks, the Romans, and the Hebrews. But why study these cultures? We should study the Greeks because the Greeks were the archetype of philosophical and literary man. They were the original philosophers and poets. Every great idea—and every lousy one—came from some Greek somewhere. All you’ve got to do is trace it back. Why study the Romans? We study the Romans because the Romans were the archetype of practical, political man. They were the road builders and the republicans of ancient times. These are the people who ran the world for a thousand years. They ran the most enduring government history has ever seen. In fact, the Founding Fathers used the old Roman republic as their model in constructing the American government. Why study the Hebrews? We study the Hebrews because they are the archetype of spiritual man. From them, we learn how God deals with individuals and with nations. In studying these three cultures, classical education does not ignore American history and culture. In fact, in order to fully understand American civilization, a knowledge of these three cultures is crucial since, as political philosopher Russell Kirk has pointed out, all three of them were essential in the forming of our thought, our political institutions, and our moral principles. We study these three cultures and the great works they produced because they constitute our heritage as Western people. Lynne Cheney, former head of the National Endowment of the Humanities under Ronald Reagan, once said that if you graduate from school not knowing what Western civilization is, then you are not really educated. She was right. Nor does classical education ignore the skills needed to get a job. 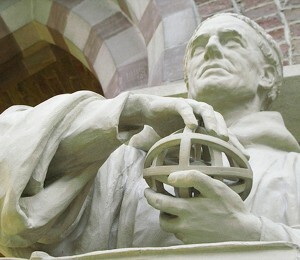 In addition to studying the great books and the stories of great men, classical education also studies the liberal arts. The liberal arts include grammar, logic, rhetoric, arithmetic, geometry, astronomy, and music. These are the generalizable intellectual skills that you use no matter what subject you are studying or what you do. The Trivium consists of the first three of these. The first was grammar, which was the study of the structure of language, and this was studied by learning a language (preferably and inflected language—one which required a knowledge of the noun cases) other than your own, usually Latin and Greek. Logic was the study of the structure and rules of rational thought, and this was done by studying the Aristotelian system of traditional logic. Rhetoric was the study of the rules of persuasion, and this was done by focusing on writers such as Aristotle, the great theoretician of rhetoric, Quintilian, the great teacher of rhetoric, and Cicero, the great practitioner of rhetoric. You would also study St. Augustine, who used the skills he learned from these great thinkers to articulate Christian truths. The Quadrivium (the last four of the seven liberal arts) consists of arithmetic (the study of discrete number), geometry (the study of continuous number), music (the application of discrete number), and astronomy (the application of continuous number). The Trivium consisted of the arts of language, and the Quadrivium, the arts of mathematics. The first was qualitative, and the second quantitative. Together they were considered to equip a thinker to approach any other subject. The most important employment skills—and the skills that many employers say are the hardest to find today—are basic thinking skills. This was what a liberal arts education taught. The goal of classical education, then, is the study of the classics in the original languages and the liberal arts: the best that has been thought and said, and the intellectual skills that equip a student to think critically. It is the cultivation of wisdom and virtue through the study of the great books and the development of basic critical thinking skills in order to pass on and preserve Western civilization. Classical education is making a comeback. More and more parents have realized that their children are being shortchanged in our schools. And more of them are realizing that it was not always this way. Martin Cothran is the Director of the Classical Latin School Association and the editor of Memoria Press’s Classical Teacher magazine. He is the author of several books for private and home schools, including Memoria Press’s Traditional Logic, Material Logic, and Classical Rhetoric programs, as well as Lingua Biblica: Old Testament Stories in Latin. He is a former Latin, Logic, and Rhetoric Instructor at Highlands Latin School in Louisville, Kentucky. He holds a B.A. in philosophy and economics from the University of California at Santa Barbara and an M.A. in Christian Apologetics from the Simon Greenleaf School (now part of Trinity University). He is widely-quoted on educational issues and other issues of public importance and is a frequent guest on Kentucky Educational Television’s “Kentucky Tonight,” a weekly public affairs program. His articles on current events have appeared in numerous newspapers, including the Louisville Courier-Journal and the Lexington Herald-Leader. Previous Post: « What is the Christian Worldview?